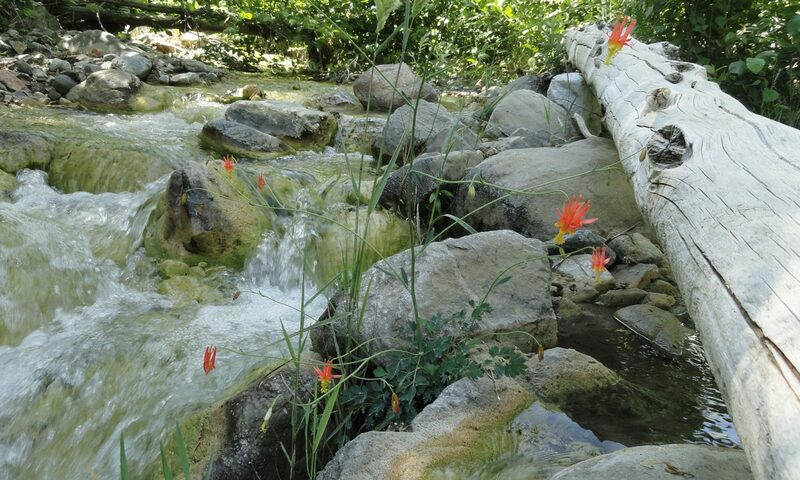 While out hiking this week, check out the newly opening leaves and flowers of the maples along side the stream side trails that radiate out of Chantry Flats. If you’re contemplating hiking up to one of L.A. County’s waterfalls, Sturtevant Falls is at its’ peak flow as of this writing. A new season’s canopy of North America’s largest maple leaves are on their way. In the open spaces of gentle sunlight and shade, look for freshly blossoming baby blue eyes. These delicate, low flowers seem to signify the Easter season in the front country of the San Gabriel mountains. New life emerges on this Big Leaf Canyon maple. Photo taken just upstream from Sturtevant Falls. Maples (Acer macrophyllum), in particular, grace both the Winter Creek and Big Santa Anita Canyons. The spans of their canopies can be vast, supported by large arching limbs. Limbs covered with emerald green mosses that come alive after rain storms. Our maples have at times been referred to as “water maples,” especially back during the Great Hiking Era. Charles Francis Saunders, in his classic “The Southern Sierra,” written back in the 1920′s describes these elegant trees in this manner. The times change, yet the plants and their capacity to evoke mood in us does not. Maples and alders, together, create a mixed green canopy to shelter the canyon bottoms from the severe sunny heat of summer days. The light under maples can take on a thick, translucent green / gold magic on late summer afternoons. In the fall, their yellow and gold leaves seem to radiate their own light against the grays and dark greens of deep canyons. In the summer time, when their sap runs, look for the dark and moist liquid seeping through openings in the bark and depositing in pockets at the base of some of the more mature trees. Wikipedia makes mention that maple syrup can be created by our species here in the San Gabriel mountains. Its’, flavor differing a bit from the traditional maple species of the northeastern U.S. I have known no one who has actually cooked down the sap from these lovely trees and made it into syrup. It takes approximately 35 gallons of sap to make one gallon of finished product! When Joanie & I used to run Sturtevant’s Camp, we’d notice that the mules would nibble at the bark of the maples in the corral area while waiting for their return run back to Chantry Flats. The fallen leaves were also a delicacy to our long-eared friends. Baby Blue Eyes along the Gabrielino Trail. Baby blue eyes (Nemophila menziesii) are beginning to poke their little heads up through glades of miners’ lettuce and chick weed. They’re visible along many places on the trail between Chantry Flats and Sturtevant’s Camp. Of course, if you go up to Newcomb Pass, you’ll see them along the slopes taking in the mild spring sunshine. They add the most beautiful dots of blue amongst the backgrounds of entangled greenery. These delicate little flowers will blossom up through May and can sometimes be seen as late as June in protected, semi-shade along canyon bottoms.